Location - The Te Marua track is located a fair distance north of Wellington. From the capital take the road north to the Upper/Lower Hutt area. Go for miles and you will eventually reach the track which is on your left. Check the official website for detailed instructions. Parking - Parking is in the area surrounding the track. For purposes of exiting the arena try and park as close to the entrance as possible. There is only one road in/out and on a big night the carpark can take some time to empty, especially with the turn onto the main highway holding up cars exiting the carpark. Premiere Meeting - The Wellington Stockcar champs is a hotly contested title. 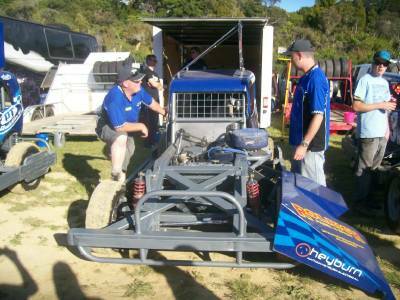 The capital city has housed the cream of Stockcar drivers in recent years and the Wellington Young Guns are one of the great Stockcar teams. Add in a fair few Palmy cars and you can only conclude that this is one of the hardest titles to win. Also worth attending - The Windy City showdown is the premiere Minisprint event outside the SNZ titles. A showpiece event in the annual Oval Superstars Series, this event showcases the best the class can offer. Best spot to sit - The track does suffer from a lack of height. The best spot is probably the poorly designed stands that maximise space to walk up and down whilst providing as little seating as possible. Other seating around the track consists of wooden benches so take a softening device to avoid numbness. 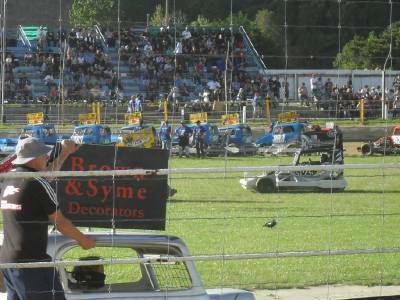 Classes run - Youth Ministocks, Stockcars, Superstocks, Production Saloons, Saloons, Super Saloons, Modifieds, Minisprints, Streetstocks, Sidecars. Uniqueness - It's a little difficult to identify what is unique about the place. The track is a standard, relatively symmetric quarter mile with little in the way of banking. The surface is also run of the mill. In recent seasons the track has developed a reputation for being among the best managed in the country so you should see a well run show when you attend.